A fascinating new biography of Ernest Shackleton lavishly illustrated with over 100 photographs, some of them never published before. This new book probes deep into family history looking at the influence of Shackleton history and Quaker roots followed by an account of his four expeditions to Antarctica. 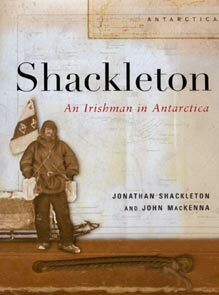 Shackleton: An Irishman in Antarctica; Jonathan Shackleton & John MacKenna (2002). The Lilliput Press, Dublin, Ireland and in North America by The University of Wisconsin Press. Ernest Henry Shackleton was born on the 15th February in 1874 in Kilkea House, County Kildare in Ireland. The second in a family of ten, his father Henry farmed at Kilkea. His mother Henrietta was descended from the Fitzmaurices, a family which had been in Kerry since the Norman times in the 13th century. Abraham Shackleton , was a Quaker from west Yorkshire who came to Ballitore in County Kildare and started a school in 1726. Famous past pupils include Cardinal Paul Cullen, Edmund Burke, famous political writer and orator and James Napper Tandy, United Irishman. In 1880 when Ernest was six his father gave up farming and went to Trinity College Dublin, and qualified to be a doctor. The family lived at 35 Marlborough Road in Dublin and in 1884 they moved to Sydenham in South London where Henry practiced for 30 years. 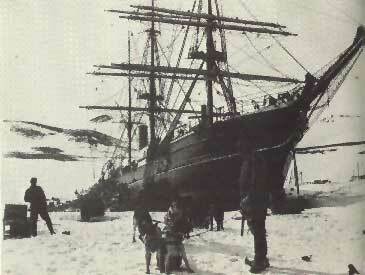 In the summer of 1901 the ship , The Discovery departed for the Antarctic. On 30th December 1902 Scott, Shackleton and Wilson reached within 400 miles of the South Pole, the furthest South yet achieved by anybody. Shackleton was invalided on the return journey and was sent home early. His experience on this expedition then spurred Shackleton on, to have a go at reaching the South Pole himself. In 1904 after his return he married Emily Dorman, they had three children Raymond, Cecily and Edward. This picture shows (left to right) Shackleton, Scott and Wilson ; Shackleton's sledging flag showing the family coat of arms is well displayed. 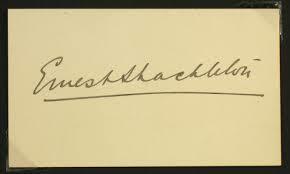 In March 1907 Shackleton outlined his own trip, which he organised himself with the minimum of official support. 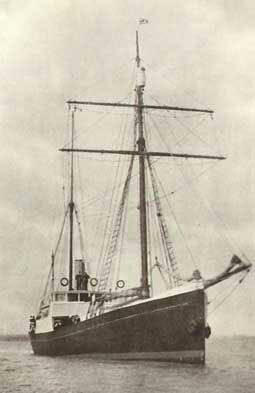 The Expedition was to leave New Zealand in 1908. The ship chosen was a sealing ship which generally worked from Newfoundland. It was brought down and arrived in London in mid-June 1907. The Queen presented Shackleton with a Union Jack to carry on the sledge journey. They ship left for New Zealand on the 7th of August. The Commonwealth Government gave Shackleton £5000 and the New Zealand Government gave him £1000 and agreed to pay for half of the cost of towing the ship down to the Antarctic Circle to save coal for the journey that lay ahead. They entered the Ross Sea on January 16th. On the 28th of January the ship froze in the ice. The next day they lowered the motorcar onto the ice pack, the first automobile on the Antarctic Continent. 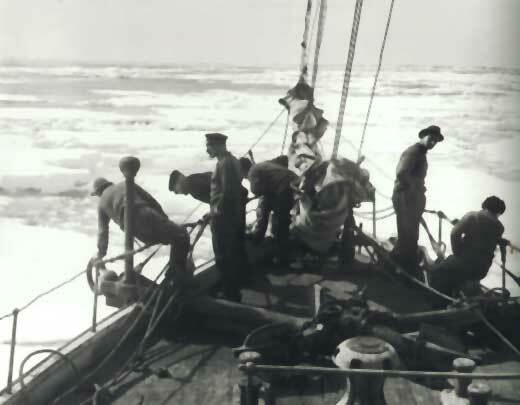 Adams, Wild, Marshal; ( left to right ) photographed by Shackleton at their furthest South. The team set up the hut they had brought with them and the men crammed in. The weather began to close in and the sun to set. On the 29th of October 1908 Shackleton, Adams, Marshall and Wild headed for the South Pole, a 1700 mile round trip. The other men had set up many depots for the journey using the motorcar for several of them. The team began to run low on rations shot the ponies for food. On the 9th of January 1909 they reached a new furthest south - just 97 miles from the South Pole. They had to turn around due to lack of food. After the Norwegian Amundsen (December 1911) and Scott (January 1912) had reached the South Pole, Shackleton thought up and attempted to carry out another great plan - to cross the 2000 mile Antarctic continent. This trip was a very successful failure. The team of 28 men and 68 dogs never set foot on the continent ( the husky dogs had come from Gimli near Winnipeg, crated in cattle cars to Montreal and shipped in the cattle boat 'Montcalm' to England ). Shackleton's ship the "Endurance"(named after our family motto "By Endurance we conquer" ) was trapped in the ice in the Weddell Sea for 11 months, from January 1915 until it was squashed and sank in November 1915, leaving 28 men on the ice with 3 small ship's boats. They then spent 5 ( admittedly summer) months on an iceberg floating away from the continent. With great good fortune they landed on Elephant Island on the 15th of April 1916. It is a small godforsaken island of rock and ice with a few penguins and seals for food. Endurance stuck in Ice Pack. Hurley and Shackleton (right) in front of a blubber stove at Patience Camp. The men playing football on the ice. Photograph of the Floor Plan of the Endurance from the family collection. So there they were in April 1916, lost to the civilised world, and heading into an Antarctic winter. Losing no time Shackleton's next move was to be one of the greatest small boat journeys ever made. Shackleton and 5 others set off in the 22 foot boat the "James Caird" on an 800 mile journey across one of the roughest seas in the world to island of South Georgia to get help. "The End' of the Endurance - November 1915. Two other members of the crew were from Ireland - Tom Crean from Annascaul in County Kerry and Tim McCarthy from County Cork. Tom Crean was one of the great crew members of the heroic age of Antarctic exploration.He was strong, courageous and good humoured and experienced - he had already already been on two of Scott's expeditions - and was awarded the Albert Medal for bravery. Frank Worsley,the superb New Zealand navigator of the "James Caird' described Tim McCarthy as"the most irrepressible optimist i have ever met". Despite their awful conditions McCarthy was always happy - and it was him who first spotted South Georgia, 15 days after they had left Elephant Island. Their extraordinary journey was not yet over - to reach help, Shackleton, Crean and Worsley then had to cross the mountains, glaciers and snowfields of South Georgia to get to the whaling station at Stromness. Three and a half months later, at the fourth attempt, Shackleton, in a Chilean tug the "Yelcho' rescued the remaining 22 crew on Elephant Island on the 30th August 1916. It was amazing that all the crew had survived. In December Shackleton left New Zealand on the Aurora to rescue the Ross Sea Party from Cape Royds - on the other side of the Antarctic , this party had successfully laid food depots along the Ross Ice Shelf towards the South Pole. Shackleton had intended to use these as he crossed the Continent from the Weddell Sea side. Upon his return, Shackleton gave a series of lectures on his voyage. A photograph of an original poster from this lecture tour is still owned by the family. The 1921 trip on the Quest was his final journey. He died of a heart attack in the early hours of the 5th January 1922 shortly after the start of the expedition, at Grytviken in South Georgia where he was buried. A few months later on their journey home the crew of the Quest erected a cross at King Edward Point, across the bay from the cemetery where their "Boss" lies buried. 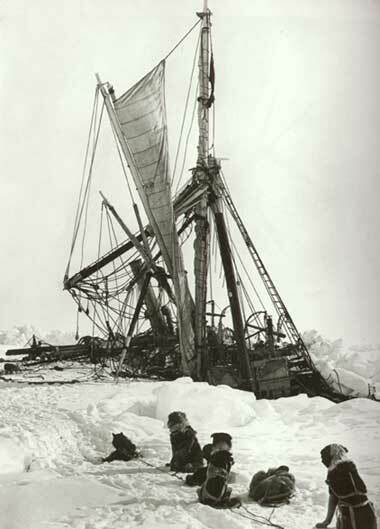 The Quest - Shackleton's ship on his final trip south.